The file synchronization function of Ozeki Cluster makes it possible to transfer any directories created on the Master node to the Slave nodes. The Master node operates as a server which stores the files and then synchronize them. Therefore the Slave nodes will be able to get access to these files. 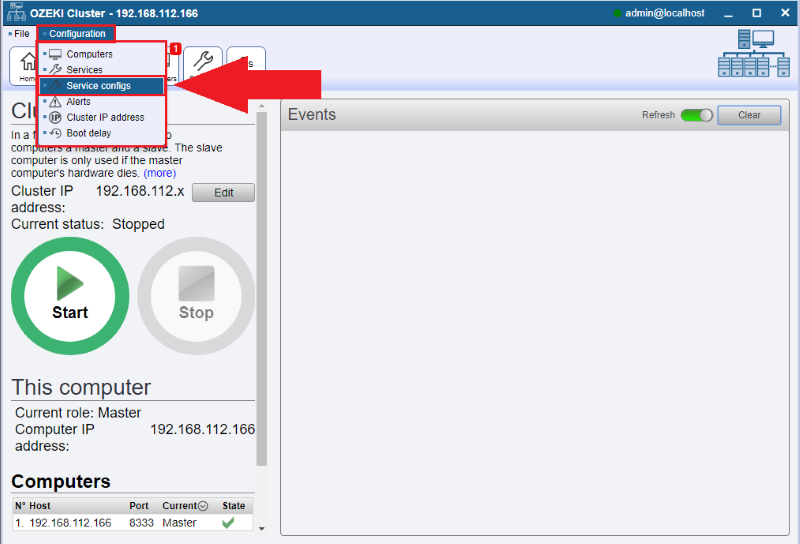 How to access file synchronization in Ozeki Cluster? Choose the 'Settings' menu on the top of the home page and select 'Service configs' submenu in order to access this function (Figure 2). 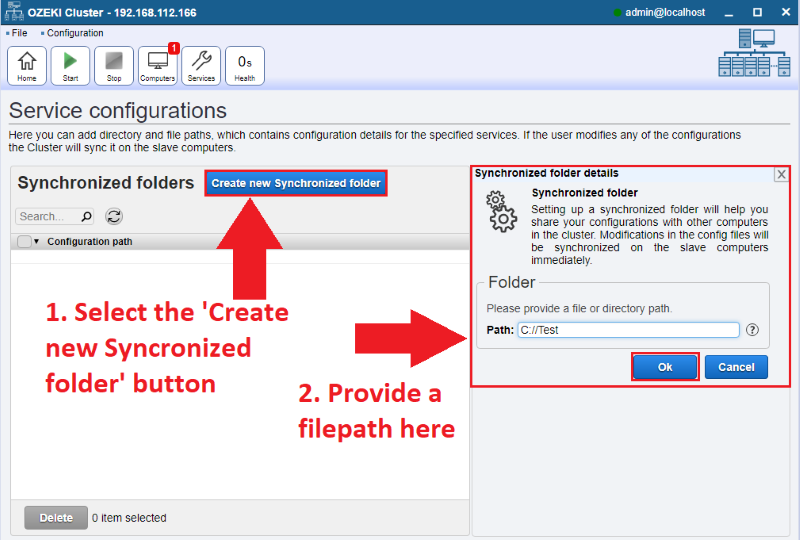 You can add directories you wish to synchronize by selecting the 'Add' button and typing in the filepathes of the targeted folder or file (Figure 3). The folders will be created to the same location on the targeted PC. Please note that your targeted PC must have a driver with the same name or the synchronization process will fail and you will receive an error message. Also the system will not accept currently non-existing or already contained filepaths. How to remove folders from synchronization? 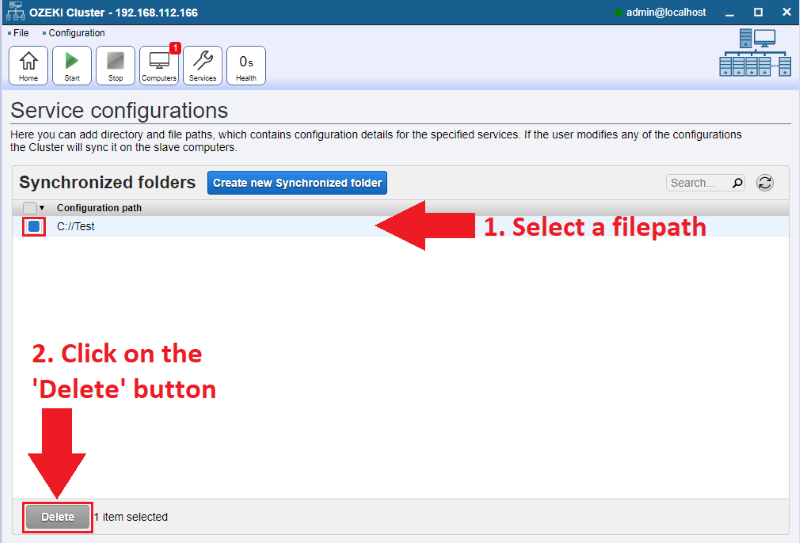 If you would like to remove folders from the synchronization please select the checkboxes of the shared folders and then click on the 'Delete' button below (Figure 4). Thank you for reading this guide. We are sure that you will gain many advantages by using the File synchronization function of Ozeki Cluster.